Introduction: There are case reports and small series reporting experience with the daVinci Surgical Robot (Intuitive Surgical, Sunnyvale, CA). 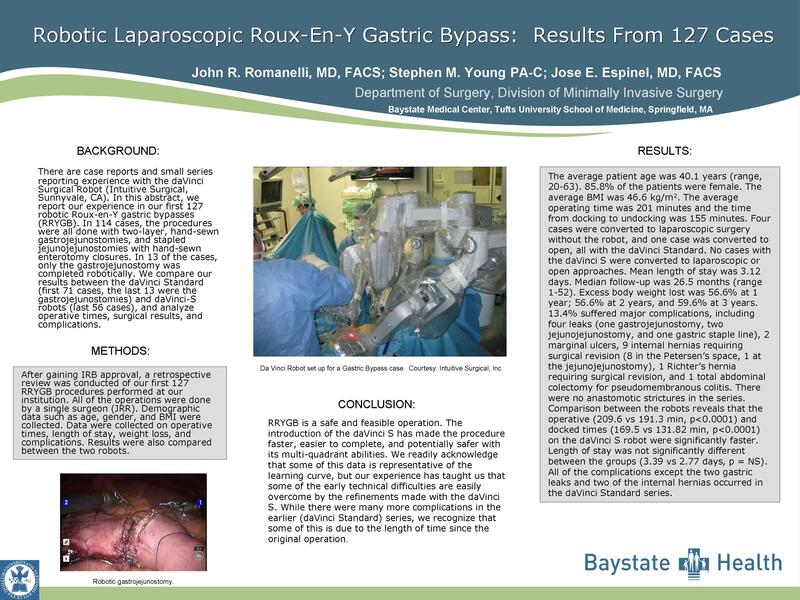 In this abstract, we report our experience in our first 127 robotic Roux-en-Y gastric bypasses (RRYGB). In 114 cases, the procedures were all done with two-layer, hand-sewn gastrojejunostomies, and stapled jejunojejunostomies with hand-sewn enterotomy closures. In 13 of the cases, only the gastrojejunostomy was completed robotically. We compare our results between the daVinci Standard (first 71 cases, the last 13 were the gastrojejunostomies) and daVinci-S robots (last 56 cases), and analyze operative times, surgical results, and complications. Methods: A retrospective review was conducted of our first 127 RRYGB procedures performed at our institution. All of the operations were done by a single surgeon (JRR). Demographic data such as age, gender, and BMI were collected. Data were collected on operative times, length of stay, weight loss, and complications. Results were also compared between the two robots. Results: The average patient age was 40.1 years (range, 20-63). 85.8% of the patients were female. The average BMI was 46.6 kg/m². The average operating time was 201 min. and the time from docking to undocking was 155 min. Four cases were converted to laparoscopic surgery without the robot, and one case was converted to open, all with the daVinci Standard. No cases with the daVinci S were converted to laparoscopic or open approaches. Mean length of stay was 3.12 days. Median follow-up was 26.5 months (range 1-52). Excess body weight lost was 56.6% at 1 year; 56.6% at 2 years, and 59.6% at 3 years. 13.4% suffered major complications, including four leaks (one gastrojejunostomy, two jejunojejunostomy, and one gastric staple line), 2 marginal ulcers, 9 internal hernias requiring surgical revision (8 in the Petersen’s space, 1 at the jejunojejunostomy), 1 Richter’s hernia requiring surgical revision, and 1 total abdominal colectomy for pseudomembranous colitis. There were no anastomotic strictures in the series. Comparison between the robots reveals that the operative (209.6 vs 191.3 min, p<0.0001) and docked times (169.5 vs 131.82 min, p<0.0001) on the daVinci S robot were significantly faster. Length of stay was not significantly different between the groups (3.39 vs 2.77 days). All of the complications except the two gastric leaks and two of the internal hernias occurred in the daVinci Standard series. Conclusion: RRYGB is a safe and feasible operation. The introduction of the daVinci S has made the procedure faster, easier to complete, and potentially safer with its multi-quadrant abilities. We readily acknowledge that some of this data is representative of the learning curve, but our experience has taught us that some of the early technical difficulties are easily overcome by the refinements made with the daVinci S. While there were many more complications in the earlier (daVinci Standard) series, we recognize that some of this is due to the length of time since the original operation.